Alles ist gut. To recommand. Mega Erlebnis! Die Mitarbeiter waren super! 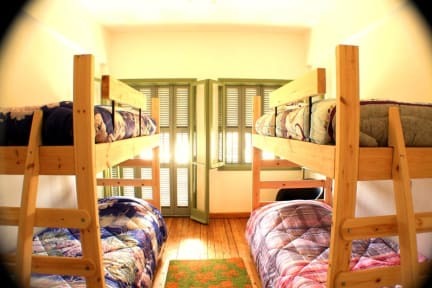 Ein tolles Hostel zum Relaxen mit anderen Reisenden. I stayed at this wonderful, small hostel for 7 nights and loved it! Located in the center of Limassol, only 5 minutes away from the old town and a big shopping street. To the central bus stop and next big supermarket aswell only a 5-minute walk. The kitchen could contain a little bit more kitchenware (for cooking and cutting) and prepare that the street next to can be noisy during night- and morning time. Overall I slept in the female dorm and met really nice people during my stay! Der Zustand des einzigen Bades ist unter aller S... Die Atmosphäre war sehr gut. Für mich war ein großes Plus die kostenlosen Parkplätze. Leider viel zu laut um zu schlafen, da das Hostel an einer großen Hauptstraße liegt. Die Matratze war auch schon durch und man hat das Gitter gespürt.